Former foreign secretary Boris Johnson called for further changes to the terms of withdrawal, which the EU has rejected, while 22 Tory MPs have written to the Daily Telegraph saying that leaving without any agreement – known as a no-deal exit – would actually be a “good deal” for the UK. 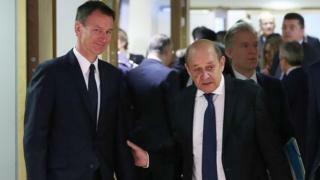 The BBC’s Europe editor Katya Adler said there were growing divisions within the EU about the length of any delay or what conditions should be attached. What about the DUP and Labour?